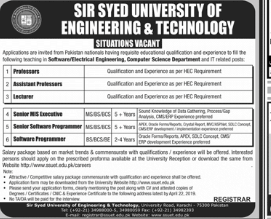 Assistant PROFESSOR Job is available with SIR SYED UNIVERSITY OF ENGINEERING TECHNOLOGY in Pakistan, Karachi. It is a Senior Level level role. This applicant should be Master qualified for this position. This job will expire on 15 May 2019. This job involves skills like Time and daily management, Scheduling of meetings, Correspondence, Note-taking, Answering phone calls, Taking notes, Scheduling meetings, Emailing Experience required is 3 Years.